In the near future, England and Wales are ruled by the Coalition – a totalitarian government that monitors its population with tracking chips implanted in the neck. While the details are fuzzy, it was the double threat of terrorism and a virus allegedly originated in the countryside that drove people to accept the Coalition's rule. An impenetrable wall now separates England and Scotland, ostensibly to keep the Scots out, but actually to keep the English in. And in a twist of reality, the Channel is heavily patrolled to keep people from making illegal crossings to Calais. Jake is an orphan, condemned to a Home Academy after his parents -- scientists working on a cure for the virus -- perish in a suspicious car accident. Separated from his beloved dog, Jake executes a daring escape. 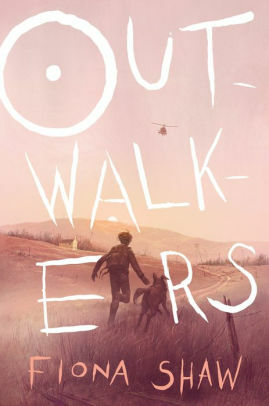 The story then becomes a non-stop adventure careening from one danger to another as Jake, his dog, and a gang of outcast children (“Outwalkers”) relentlessly head north in an attempt to cross the border. The pace in this dystopian action adventure never lets up. And while this is an ensemble piece with a variety of distinct and well-defined characters, we don’t spend much time on the human element. For me, the non-stop action and lack of real character building was simply exhausting (and why I also don’t watch superhero movies either). There are hints of romance and a certain amount of bonding between the characters, but the story is basically just a jumping back and forth through different crises. The ideas, while colorful, are not terribly original and the story breaks little new ground.